Für alle, die sich für Rohkost interessieren lohnt es sich die website genauer anzuschauen. Mimi Kirk ist 73 und lebt seit 40 Jahren vegetarisch. I am the mother to four children, 2 girls and 2 boys. I also have 7 grandchildren. I grew up in Hollywood California. Married at 17 and widowed at 29. I’ve been a vegetarian and vegan for the better part of 40 years. I’ve had an amazingly interesting, fantastic life. 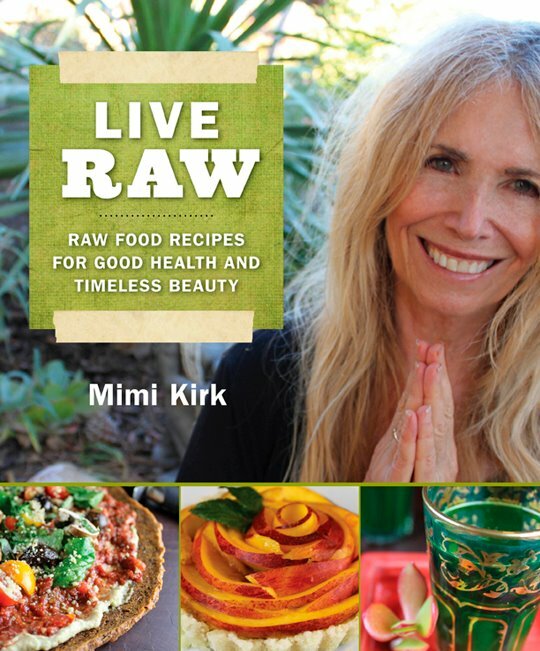 I tell many stories in my book LIVE RAW. Since winning the title of the “Sexiest Vegetarian over 50″, and so many people asking my secrets on health and longevity, I thought this was an opportunity to share my life and possibly help others to transition into eating a plant based raw food diet. For those of you who don’t know about me, i was born September 23, 1938 which makes me 72. Feeling like you’re in your 20′s at 73, is quite an amazing thing. I accredit this youthful look and spirit not only to my attitude, but really to my way of eating which is a raw vegan – living foods lifestyle. Ich hab schon Videos von ihr gesehen… wirklich erstaunlich!